The actress Therese Giehse was born as Therese Gift in Munich. Her impulse for acting was already present in her juvenile years although her father was against this wish. Yet she pursued her goal resolutely and became soon one of the greatest stage stars in Germany. He made he breakthrough in 1925 an the Schauspielhaus München, one year later followed an engagement at the Munich Kammerspiele. She founded together with Erika Mann the political cabaret "Die Pfeffermühle" in 1933. 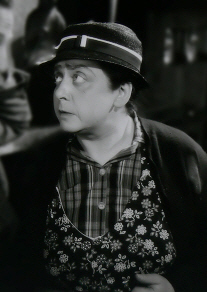 Therese Giehse made her film debut in 1928 with "Wenn die Schwalben heimwärts ziehn" (28). But the film played a subordinated part in her career which also is the reason that she only took part in few movies. In the 30's she appeared among others in the movies "Peter Voss, der Milionendieb" (32), "Die verkaufte Braut" (32), "Meisterdetektiv" (33) and "Rund um eine Million" (33). When the National Socialists came into power in Germany she emigrated to Switzerland because she was a Jewess. There she continued successfully her theater career at the Zürcher Schauspielhaus. Among others she impersonated the leading role in Bertolt Brecht's première of "Mutter Courage" in 1941. Beside it she also acted in some Swiss movies like "Die missbrauchten Liebesbriefe" (40), "Menschen, die vorüberziehen" (42), "Das Gespensterhaus" (42) and "Die letzte Chance" (45). Her popularity on German stages was still on the same high level after the war. Although in movies she appeared time and again. To her post-war movies belong "Anna Karenina" (48), "Muss man sich gleich scheiden lassen?" (53), "Kinder, Mütter und ein General" (55), "Der 10. Mai" (57), "Mädchen in Uniform" (58), "Die Physiker" (64), "Die Mutter" (71) and "Lacombe Lucien" (74). Therese Giehse was a close friend of the family Mann und of Bertolt Brecht who described her as "the greatest actress of Europe".